On June 7, 2016, President Barack Obama nominated Major General Stayce Harris, B.S. ’81 industrial and systems engineering, to the post of assistant vice chief of staff and director of the air staff for the United States Air Force. When the Senate confirmed her appointment in August 2016, Harris became the first female African-American to ever achieve the rank of Lieutenant General for the Air Force. Harris received a commission in the Air Force through USC’s Air Force ROTC program and served on active duty until joining the Air Force Reserve in 1991. A command pilot, she has flown more than 2,500 hours in numerous military aircraft and more than 10,000 hours in civilian aircraft. Previously, Harris served as the commander of the Air Force Reserve’s 22nd Air Force at Dobbins Air Reserve Base, Georgia, where she commanded more than 15,000 citizen Airmen, 105 unit-equipped aircraft and worldwide operational missions, including specialized hurricane hunter, fire suppression and aerial spray missions. The self-described “diehard Trojan” has received many awards and decorations, including the Legion of Merit and the Defense Superior Service Medal. We talked to her about her 34-year adventure in the Air Force, her love of jazz, engineering, her father, the ‘coolest’ aircraft she’s ever flown, and what the future holds for young women who dream of flight. What inspired you to join the Air Force? Are there people who influenced you to say: “that’s what I want to be when I grow up”? I was born in Los Angeles. My father was career enlisted in the Air Force, so I grew up as a military brat. Basically, I’ve been serving ever since I was born. In my mind, all I wanted to do is grow up to be just like him. When I was eight years old, I’d watch my dad go to work every day in a light blue shirt and dark blue pants, but I didn’t have a clue about his actual job. All I knew is that every two years we’d move to another exotic location. And that’s what I enjoyed – the ability to travel the world. It wasn’t until I entered high school and started taking Junior ROTC that I knew I had the propensity to serve and wanted to be an Airman. When you entered high school, your family settled in Fayetteville, North Carolina. What was that like? And why did you leave Fayetteville after graduating? My father had retired by then and we moved to Fayetteville to be close to the family home state of North Carolina and Pope Air Force Base. His retiree benefits allowed him to enroll at Fayetteville State University to pursue his undergraduate degree. So, it turned out that my father and me were freshmen, sophomores, juniors and seniors together. He was in college; I was in high school. And I worked very hard to do well in school so I could be eligible to have a scholarship paid by the Air Force that allowed me to go to USC; because otherwise I wouldn’t have been able to afford to go to USC. My mother worked in banking at the time. In the summers, I interned at her bank. She was a whiz at math. That’s where I got my love of math, from my mother. Why did you choose engineering? Specifically, industrial and systems engineering? I’ve always loved math and I was trying to figure out the best course of action to serve in the Air Force. At the time, the Air Force was offering scholarships for those who wanted to be engineers. So I thought, why not an engineer? I had a fair idea of what an engineer did. Initially, I thought I would be a chemist or some type of scientist, but the Air Force offered an opportunity to be an engineer and it just opened up an abundance of opportunities from there on. For me, industrial and systems engineering brought together engineering, technology and how to put them to human use – the ergonomics of design, especially, and robotics. So when I graduated in 1981, ergonomics and robotics were on the forefront. And I just found that fascinating. You know, you can design the perfect car, but what dials do you display and where and how far do you place them? That type of ergonomics engineering just fascinated me. I thought I would do that type of work in the Air Force until I had an ROTC instructor speak to me about becoming a pilot, and that opened up a whole other world of opportunities. Can you talk about a moment when your engineering experience came in handy? You know, it comes in handy all the time because I believe engineering teaches you how to think and problem solve. Flying aircraft is all about making mental, mathematical, problem solving decisions. So my engineering background made it easy for me to problem solve when trying to figure out diversions, or descent rates, or best routes to fly to a destination because I was used to being a problem solver. What about now? How are your engineering skills being put to the test? I think they always are. In the previous job I had, which was 22nd Air Force Commander, I had 15,000 airmen across 30 locations in the United States. Now with my role as the assistant vice chief of staff of the United States Air Force and director of staff of the Air Staff here in the Pentagon, I’m always problem solving. But where my engineering background really comes into play is during acquisition discussions, which is a large component of what we do in the Air Force. It’s usually acquisitions of airplanes, different weapons systems and technologies. And because of my engineering background, it’s much easier for me to grasp these concepts because they are more familiar to me due to the education I received in engineering. I have a greater awareness of the designs and it allows me to appreciate what we’re acquiring as far as new technologies. You get to interact with a lot of engineers and scientists; you probably also speak their language. Absolutely. And even if I don’t speak it as well as them, I definitely understand it. It makes communication easier when you’re basically speaking the same language. And it also makes me very curious. There has been many a time when I thought about working for the Air Force Research Laboratory, getting into the grass roots of design and implementation of new technology. 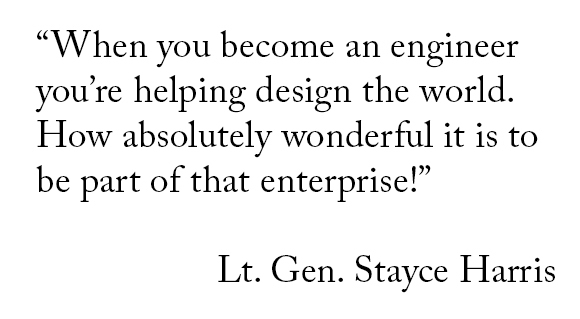 It always stays on my mind, and that makes me even more interested in what we do acquire for our nation’s defense. Take us back to your time at USC. How would you describe your SC experience? I loved my time at USC. I’m a diehard Trojan. If you saw my office, you would see a bobble head of Marcus Allen; you would see a Trojan cup. My friends always give me SC stuff to put in my office. 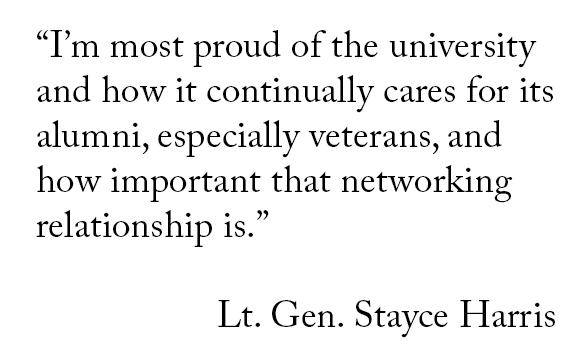 But I’m most proud of the university and how it continually cares for its alumni, especially veterans, and how important that networking relationship is. That’s the same type of thing that we have in the Air Force, you know. We’re a community that cares for each other, and you’re always a member of that community. And I feel the exact same way about SC. I am always a Trojan, always welcomed, and I have that network of friends and colleagues that I can interact with and reach out to. How did you support your education? My Air Force scholarship paid for all my tuition and books and a stipend of $100 a month, which in 1980 was a fair amount of money. Then, I also worked part-time, mostly in the anthropology department. But the scholarship allowed me to enjoy the SC experience without the stress of having a lot of student loans. I went to SC, first of all because it was a great engineering school. But I also knew the graduate school of engineering was larger than the undergraduate school, and to me, that messaging was really important because it showed how much SC valued the research potential of its students. So I knew that I was going to have a great quality education and get more personalized attention. Describe a moment when you failed. What did you do? How did you rise from that and what lessons did you learn? Life is full of failures. In pilot training, which was a very demanding process, there would be times when I’d fail a ride. But you only get three, maybe four, opportunities to fail a ride before you’re eliminated from pilot training. So when I did fail it was my survival opportunity. To pick myself up, to study more, to learn the techniques better or just fly a better aircraft to ensure I was worthy of becoming an Air Force pilot. So, for me, it was daily perseverance, which is now kind of my hallmark. I always tell people persistence pays off. You’ve got to really want it and you’ve got to work hard for it. And you have to let people know that you do want it. Because if you show a drive and a passion towards a goal, and you’re willing to work for it, then others are willing to work with you and for you in achieving that goal. What’s the coolest aircraft you’ve ever piloted? The coolest one for me was the [Northrop] T-38 Talon. It’s the second aircraft you fly in pilot training and can go supersonic. It was like strapping a rocket to your body. Incredibly maneuverable – we still fly it to this day – but totally the most fun. Part of completing training is to fly solo flights, and so I remember soloing the T-38 on my birthday in 1984. Just the greatest thrill of all! As far as heavy aircraft, you may or may not know that I’m also a pilot for United Airlines currently on a military leave of absence, but the plane that I absolutely adore, as far as heavy aircraft, is the [Boeing] 747-400 – just a magnificent four-engine jet that once again is very maneuverable for its size. It weighs 875,000 pounds, so it’s a lot of plane but just a dream to fly. Still a tremendous amount of excitement rallying all the entities that make up the Air Staff, whether they be our personnel, our strategists, logisticians, finance, our nuclear specialists. My role is to ensure that there is synchronization, information flow and that taskings get completed. You’re really rallying the team to support the Secretary of the Air Force, the Honorable Deborah James and the Chief of Staff of the Air Force, General David Goldfein. It’s very much a leadership role to ensure that we’re running the business of the Air Force while taking care of our Airmen and providing defense for our nation. It pretty much starts when I wake up. My day starts before I even show up for work, right around five and it goes until seven. Usually, when I get home, I take time to rest and recharge. How do you deal with the stresses of the job? First of all, I have magnificent friends. Then, there are things that I enjoy doing. Number one, I love to travel around the world while attending jazz festivals. That’s how I spend my recreation: traveling, jazz, scuba diving, skiing; you know, activities that free my mind but still have some adventure to them. Who are some of your favorite jazz artists? If I go straight ahead then, of course, there is John Coltrane and all the great American standards. I like to listen to straight ahead jazz live. I just put myself back into that era of the 1930s and 40s thinking that I’m in a smoky jazz club and there’s somebody on the bass playing and somebody on the trumpet playing and put myself into that vibe. But I love that smooth jazz also. Anything from Euge Groove to Marion Meadows. I just enjoy anything jazz. You’ve achieved many distinctions and a long list of firsts, but what is the thing that still humbles you to this day? Hearing back from the Airmen that I served with and have led and have mentored. Being part of something greater than yourself is wonderful. Being able to mentor those that will follow in your footsteps and paying it forward through them, that to me is the most humbling and rewarding. Being able to take care of Airmen, to watch them thrive and grow and want to do the same for others. It’s what we call being a good wingman. It’s part of the Air Force core values, taking care of each other. It’s part of the fabric that becomes you. I go out to high schools and aviation summer camps and meet a number of young women who aspire to fly. It’s nice to see that because in the early 80’s flying was not typical for women. Now it’s wonderful to meet a young woman who tells you: “All I’ve wanted to do, ever since I was little, is be a pilot.” I think that’s amazing to see them realize that there are no barriers. All you have to do is to help them and encourage them to follow their dreams because the opportunities are there. I do it on numerous occasions whether it is one-on-one mentoring with someone who is interested in flying or whether I’m addressing Junior ROTC or ROTC units. But I tell people the same thing. Number one, find your passion and be persistent in your goals. Define and develop your goals. And then learn everything you can about what you want to do. But then, keep plugging through it because failures and setbacks do happen. It’s all a part of the growing process to make you better in the end. There’s goodness in adversity. It shows your mettle and how much you truly desire to become what you want to become. We currently suffer a shortage of female engineers, as well as female Air Force pilots. What are some of the things you would like to do to change that and where do you think the focus should be? The focus should be reaching the youth early, as early as elementary school, to inspire them to pursue STEM career fields. We need to make it exciting, have them perform experiments that will pique their interests. You know when you become an engineer you’re helping design the world. And the future technologies that will make our world better. How absolutely wonderful it is to be a part of that enterprise! You’ve gone further than your father has gone or perhaps even dreamed of going in the Air Force. What do you think he’d say to you now had he witnessed your trajectory and ascent? My father was with me up until 2002, and he knew that I had graduated from SC, that I had become an Air Force officer, a pilot, a commander, had gotten off active duty to become an airline pilot and then entered the Air Force Reserve. Then, right before he passed, he knew that I had achieved the rank of colonel in the Air Force. He was very, very proud. I used to take my dad traveling with me on my trips just like he used to take me when I was younger. Everybody knew my dad and my dad knew no strangers. When my friends found out that I was going to be promoted to general officer they all said: “Clyde’s smiling down right now. He’s so proud.” I’m sure he would be. He’d also be glad to know that I’m now back on active duty serving our nation. And I’m so proud and honored to do so!